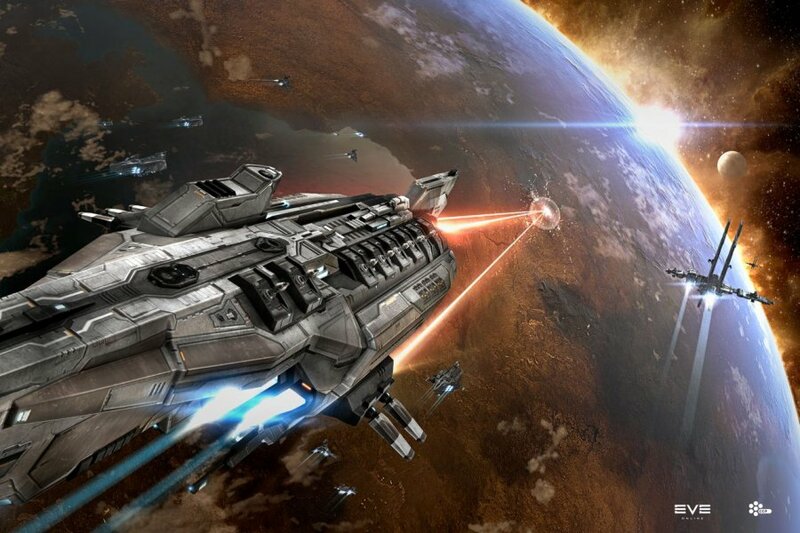 Eve Online is entering it's 11th year as one of the only space MMOs in existence. Also this year, CCP launched Dust 514, a free to play first person shooter on the PlayStation 3 which ties into the world of Eve. These two worlds combine to form a massive universe in which over 500,000 inhabit, thrive, and role play. At E3 2013 we sat in on a meeting with several members of the development team who were obviously proud of the company's accomplishments. CCP started as a small company located in Iceland and now spans the globe with hundreds of employees. Their game Eve Online is in the Museum of Modern Art alongside titles like Pac-Man and Tetris. The game is the ONLY MMO to have consistent growth year over year since it launched, and in 2013 CCP doesn't see that changing. There's good reason these are proud folks. In fact, CCP has an aggressive plan to continue growth through other mediums like TV. Through a partnership with Kormukar (and Icelandic production house) they are launching a TV series based on actual in game events. These aren't events that the team writes, but rather actual player driven events. Events like a 3200 player battle that was triggered when the largest ship in the game mis-jumped into an enemy sector. It's because of events like these that CCP not only wants to promote them, but give players more control. What many people don't realize is that the world of Eve self governs. We were told about the most revered pilot in Eve, a man who had a fireworks celebration outside of his space yacht to celebrate the 10 year anniversary. Why is he so revered and respected? Because he's honest. He gets hired to broker deals between groups and mediate transactions to make sure they go smoothly. You see, like the real world, Eve is also filled with people who can do nefarious things, and while it isn't encouraged - it's part of the lifeblood of the game. Eve just released its 19th free expansion pack called Odyssey. CCP believes in keeping the player base all on the same page. And while the universe continues to expand, it's never splintered. Later this year CCP and TwitchTV are partnering up for native streaming from Eve, which should help the audience expand even further. If space economy simulator isn't your bag of tea, CCP has something for action fans. Dust 514 is their free to play shooter for PlayStation 3 that launched last month. The really slick thing about Dust? It actually shares its game world with Eve. Players in space can support ground battles and the ground battles can help take over a territory for factions. In one event that took place across games, players on the ground managed to bring down a massive carrier that was hovering around a planet. The players on the ground watched as the carrier fell burning from the sky down onto the planet. We were told about an interesting cross medium piece of teamwork where Dust and Eve players took to Reddit to organize a hostile takeover of a planet in a heavily contested sector in the game. The organized effort drew a huge battle and the planet was plucked from the control of the opposing faction in no time. Stories like this truly make you appreciate the technology CCP has in place to make something like this possible. And while Dust has had it's share of issue, CCP is committed to keeping things updated. Both the UI and graphical details are going to be continually tweaked. There are plans to continually add drop suits, with a pilot and commando already in the pipe. 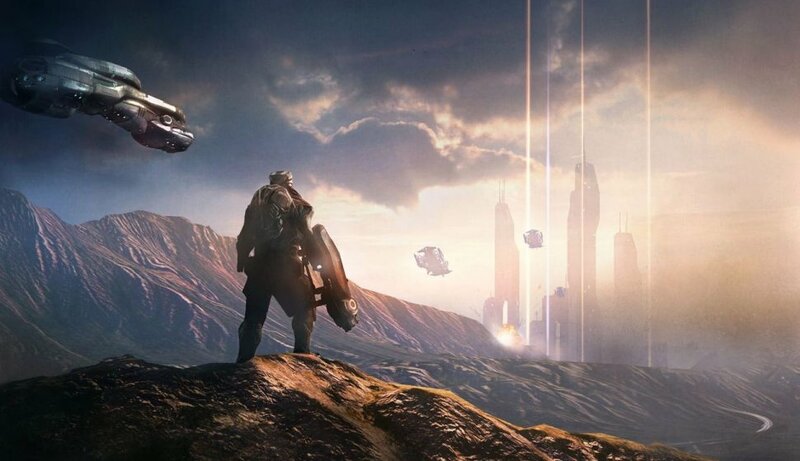 Sadly there's no co-op mode currently in Dust 514 and there's nothing on the radar, but if the demand is there, never say never. Before I left I was treated with a 5 minute demo of Eve VR. This is a vertical slice of a bigger game, though the developer on hand wouldn't divulge anything further than that. 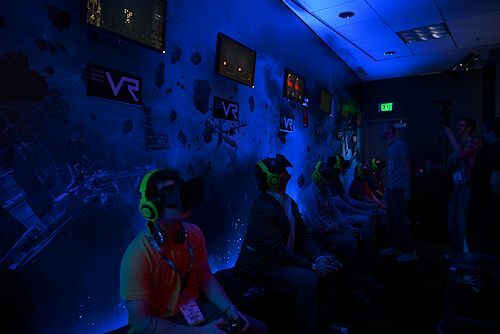 As it stands, Eve VR is a space combat action game which pits 3 players versus 3 players using the Oculus Rift VR headset and an Xbox 360 controller. I sat down and the developer attached the headset. I immediately could look around the cockpit of my virtual ship. The headphones went on and suddenly the noise of E3 was drowned out and I was in the quiet of space with the hum of the ship's engine. The developer told me to look left, right and up to orient myself. Now keep in mind I'm sitting on a chair to play this, but then he tells me to look down at my legs. I look down at LEGS...but not my legs...the virtual legs. The human brain at this point really gets a bit confused because it expects to see one thing and it sees another. But something definitely clicks and it's hard not to smile and simply sink into the game. Eve VR itself is simple, but fun. Being able to freely look around for enemies in 360 degrees of freedom is nice. The missile lock on mechanic uses some slight head tracking to keep the reticule locked on the enemy before firing. We actually took the combat to a draw, but it was impressive. The Oculus has definitely lived up to its hype - and once the headset gets a better display - it'll be incredibly immersive. We talked about a lot of stuff here. While there was some new stuff to talk about from CCP, the entire appointment was no doubt a "this is what we're about" kind of shindig. By day 4 of E3 this was a nice change of pace and I really enjoyed learning all about this world that CCP loves so much. Page created in 0.6254 seconds.